This is an on-going story (updated regularly) about all the best kept Japan travel secrets. If you're the type of traveler who likes the road less taken by, then this is for you. If you don't mind getting lost, jumping on local trains and buses, and exploring with your own two feet, then "have love, will travel." Rishiri & Rebun: Cream of the cream of the Crop in Hokkaido Japan. Japan comprises of four big islands: Hokkaido, Honshu (the main island), Shikoku, and Kyushu. Hokkaido is the northern most island of Japan and in terms of raw abundant nature and size, it's paradise for the outdoor enthusiast, cyclist, hiker, and landscape photographer. It's this strange and beautiful marriage of European and Japanese elements that makes it different from the rest of Japan. And just northwest of the island are a pair of small islands that are without a doubt the cream of the cream of the crop: Rishiri & Rebun. Summertime is the best season to visit. Blue skies. Bluer waters. Verdant fields and mountains. It's a nature lover's dream. Local towns may be celebrating their municipal holidays, and it's a great glimpse into the small town fishermen lifestyle, especially when the sake (Japanese alcohol) is flowing and everything seafood is on the grill. Speaking of seafood, nothing can compare to the grilled fish and sea urchin the islands deliver. After all, when a town is having a sea urchin festival [editor's note: Hands-down the best sea urchin sushi I've ever had], you know they take pride with their ocean offerings. Although Tokyo (Tsukiji) may be the most iconic and most popular destination for sushi, the best seafood comes from Hokkaido, especially Rishiri & Rebun. To get to the islands, take a ferry from Wakkanai and enjoy the clean waters and feed the hungry (and hopefully not angry) birds. There are a few big hotels, but stay with a minshuku (mom and pop bed and breakfast) for a more authentic feel and exquisite homemade dinners. If pressed for time, there are daily bus tours that take you around each island in a single day, so plan at least two days to stay. These bus tours are booked at the port you arrive at and also depart from there, so it's very convenient. Rishiri & Rebun are the vibrant gems of Hokkaido and Japan. So while traveling around Hokkaido, which has many of it's own fine treasures, if you want to go the extra distance (spiritual and physically), you'll be rewarded with many sights, smells, and sounds. Nachi Fire Festival in Wakayama. Wakayama is Japan's best kept secret. The prefecture offers a little bit of the everything about the unique Japanese travel flavor without the crowds. Koya-san (Mount Koya) is a collection of secluded Buddhist temples, ancient graves and statues, majestic trees, and mysterious morning fog that overwhelms the sense. Just wandering for hours never gets old and brings a nostalgia for all things Asia you think you should feel and imagine. If you can stay overnight at a skukubo (temple lodging), then you'll get to experience the ultimate satisfaction in simplicity and traditional Buddhist lifestyle. It's a delicate experience that you'll never forget. And you'll get to understand the intimacy of peaceful zen. Kumano Kodo is a network of hiking trails in Wakayama. However, these aren't just hiking trails, but also ancient pilgrimages the Japanese have taken over 1,000 years. Lots of shrines, lots of trees, a very spiritual adventure and a great way to experience a natural Japan when you're done with the cities. Must see: Hongu Taisha (one of three famous Kumano shrines) and Oyu no Hara (the biggest torii in the world). And yes, there are traditional costumes to wear if you want to play the part. Nachi Taisha Shrine is a photographer's dream. In one shot, you can get Japan's tallest waterfall (Nachi no Taki) and a beautiful orange pagoda (Seigantoji) that captures the essence of Japan. Besides being one of the famous Kumano shrines, every July 14th, the Nachi Fire Festival is held (pictured above). Although you have to get there early to get a good seat, once the fire show starts, it's a brief but powerful spectacle. Yamadera Temple overlooking the mountains. Yamadera is a holy temple that sits on top (and sides) of a mountain with one of the best temple and valley views in Japan. Located near Yamagata city in Yamagata prefecture, it's a bit of a distance located in northern Japan (also known as Tohoku). The upper area of the temple can only be reached by climbing over 1,000 stone steps, so it requires some level of fitness. The hike is beautiful, layered with shrines, statues, and stone lanterns. And once at the top, the views are magnificent. The ability to see the rows mountains while on temple grounds allows you to transport back in time when the monks centuries ago had the exact same view and serene feeling. Summer is a good time for the greens, but autumn also brings out the famous Japanese autumn colors known as kouyou. If possible, try and find some tama konnyaku, a savory Japanese snack made from konjac root powder (think chewy gelatinous rice-like balls) and soy sauce. It's got no calories! A couple walks through the light tunnel in Nabana no Sato. Nabana no Sato is where winter magic happens. Located in Kuwana, Mie Prefecture, the theme park known for flowers in spring and summer is converted to the best winter illumination in Japan. The park is illuminated with over 8 million LED lights. Along with the whimsical winter weather, it creates a fairytale-like atmosphere that Disney fans would appreciate. So expect lots of couples, selfies, and just smiles all around. The Tunnel of Light is a surreal experience, like a wonder wall of stars that leads towards the main exhibition (a themed light display that changes every year). Another light tunnel in pink LEDs serenades you as you leave. Although cold and a bit crowded, the Nabana no Sato winter illuminations is a cherishable moment, especially when shared with a special other. To have a more personal (aka less crowded experience), visit during the off-season just before the winter holidays or right after, around early December or late January. And since it's close to Nagoya city, you definitely have to try some misokatsu, a fried breaded pork cutlet (tonkatsu) smothered with a delicious miso sauce. 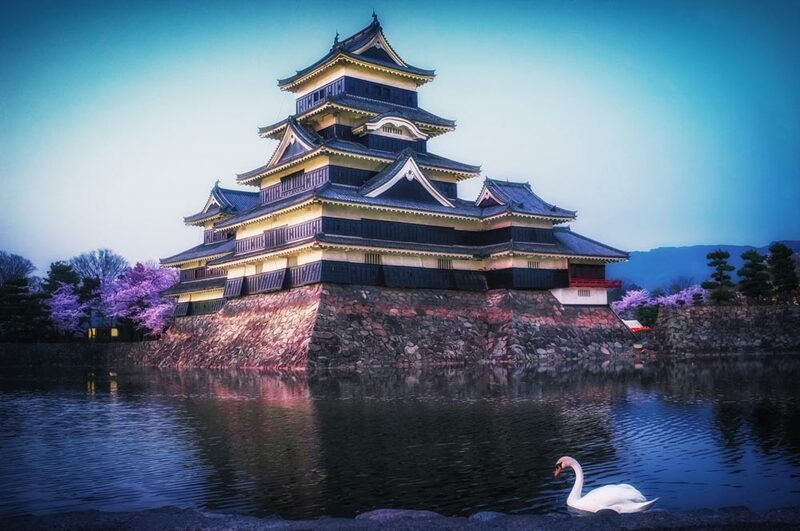 A swan floating during the cherry blossom season at Matsumoto Castle. Known as one of the Three Famous Castles in Japan (the impeccable Hirosaki Castle and spacious Kumamoto Caste are the other two), Matsumoto Castle in Matsumoto, Nagano Prefecture is worth the visit especially during the cherry blossom season. When combined with Takato-jo Castle in Ina, Nagano [Editor's note: It's my personal favorite] and Takada-jo Castle in Joetsu, Niigata (you could do two of the three in one day), it'll be enough cherry blossoms and castles and guard towers to last a lifetime. And serious, serious bragging rights. Matsumoto city is also close to Nagano city which houses the famous Zenkoji temple, which maintains the first Buddhist statue brought to Japan when Buddhism was introduced to the country in the 6th century. And since we're on a food roll, try the miso ice cream. It's like the bacon chocolate of the east. Nishinoshima in Oki Islands features Japan's highest cliff. Just north of Shimane Prefecture, tucked away like treasure in the Sea of Japan, the Oki Islands features some of Japan's most dramatic landscapes while maintaining the sleepy small-town charm. While each of Oki's four main islands are worth the visit, Nishinoshima is the first to see. Kuniga Coast rivals with even the best of Hokkaido's. The majestic coastline stretches like a wide grin around the island and provides all the condensed beauty in one area. From the highest cliffs in Japan (Matengai Cliff) to sea caves (Akekure-no-Iwaya), sea stacks (Tenjyoukai also known as Heavenly World), and sea arches (Tsutenkyo Arch), everything here is photo-worthy. But besides the landscapes, the general atmosphere is just perfect for the traveler who likes to take it easy. Stay at a minshuku and enjoy the slow-paced local life. Visit Takuhi Shrine for a very atmospheric and enjoyable short hike. The community thrives on fishing, so expect fresh and exotic seafood. Cows and horses share the road with people (and also have the right of way, so no road rage, please) and are also out and about in the open fields, so keep a respectful distance and enjoy the country coastal life. Sign up with your email to get stories about all things Japan.